Is Dialysis the next big opportunity in Indian Healthcare? With increasing life expectancy and prevalence of life style diseases, US has seen an increase in prevalence of chronic kidney disease (CKD) in the last decade. In western countries, diabetes and hypertension account for over 2/3rd of the cases of CKD. In India too, diabetes and hypertension today account for 40–60% cases of CKD. According to a recent study, China, India and USA are among the top three countries with a high number of diabetic population. While the numbers climbed from 20.4 million in China in 1980 to 102.9 million in 2014, the rise has been equally dramatic in India from 11.9 million in 1980 to 64.5 million in India. Similarly, according to a recent survey that covered 200,000 people across 24 states in India, one third of the country's population suffers from hypertension. End stage renal disease, or ESRD, is the last stage of chronic kidney disease (CKD). This means that the kidneys are functioning below 10 percent of their normal function, and they can no longer support a person’s day-to-day life. At this stage, the kidneys can no longer remove waste and/or excess water from the patient’s body. ESRD usually comes after CKD. When ESRD is diagnosed patients need dialysis or a kidney transplant to stay alive. Dialysis removes waste from the blood and/or excess water when the kidneys aren’t functioning. It may be performed either at a dialysis facility (in-center) or at home, using home haemodialysis or peritoneal dialysis if the patient is a good candidate for one of these treatments. However the fact is that only 30% of the patients are actually aware that they are suffering from ESRD. Also, only 10% out of these actually undergo dialysis. Hence the immediate addressable market is 3.0% of the total potential which works out to Rs 1,700 crores annually. As the awareness level increase, the market will keep expanding. The lower penetration of dialysis today can be attributed to lack of availability of medical practitioners, low presence of healthcare services and most importantly lower awareness about CKD. In addition, the high cost of dialysis is also a deterrent in most of the cases. Which states in India have the largest opportunity? As can be seen in the charts and tables, Indian dialysis market has a huge potential of growth and the opportunity to capture the untapped market in urban and rural regions. 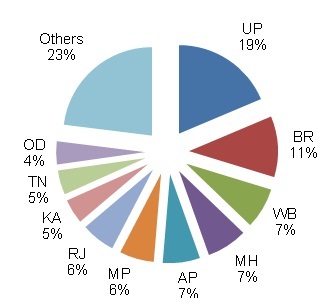 In urban region as a state, Maharashtra has 13% share of potential dialysis market followed by Uttar Pradesh (12%), Tamil Nadu (9%) and West Bengal (8%) On the other hand, Uttar Pradesh is leading with 19% market share in rural India followed by Bihar (11%), West Bengal, Maharashtra and Andhra Pradesh (7% each). 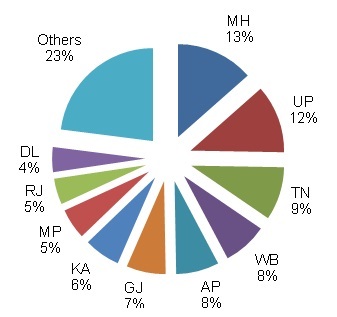 Overall Uttar Pradesh, Maharashtra and Bihar are the largest markets for dialysis. On the supply side, 30% of dialysis centres in Tier1 cities are in Maharashtra. East India hardly has any dialysis centres. Hence the gap is highest in East India. What are the critical success factors for this health care offering? Dialysis is a very costly affair for lower and middle class patient. To tap this huge segment, it is very important to get government empanelment through various schemes run by central and state government. E.g. ESIC, ECHS, CGHS. Various state governments also run insurance schemes for lower and middle class patients who are not in condition to afford such high cost dialysis services. By getting empanelment, dialysis centres can secure continuous source of dialysis patients. Kidney patients always feel mentally tired after a long dialysis session. They look for the dialysis centre closest to their residence or those which are well connected to the nearby location with adequate transport facility. Dialysis patients have to reach the centre thrice in every week. A typical dialysis session lasts for about 3 to 4 hours. Also the sessions are required three times a week on an average. Hence a lot of time is spent by the patient in the dialysis centre. Hence staff should be well trained as well as friendly. Also the treatment involves various steps related to blood transfusion through dialyzer and dialysis machine. The dialyser is also stored in most cases for repeat use. Hence hygiene is also critical. Tie ups with multispecialty hospitals is important to get patients confidence and make them comfortable with services of dialysis centre. When it comes to health, patients trust well known hospitals. They do not put their belief directly on standalone centres unless there is a strong push of a reputed Nephrologist or hospital. What are key challenges to this industry? The healthcare infrastructure is considerably limited to large towns. Due to the lack of availability of professional medical service, the patients get detected with CKD at very late stages. In addition, the poor infrastructure of the hospitals and lack of trained staff leads to patients travelling large distances for dialysis. Given their low income group, they find it very difficult to manage the higher costs of dialysis and the travelling expenses. The various schemes initiated by the various government bodies are aimed to facilitate and support the treatment cost of dialysis for this patient group. But the healthcare institutions empanelled on these schemes often face a challenge due to lower charges per dialysis offered under the scheme coupled with delays in payment. The average credit period across the board is around 45 days. 1) New Enterprise Associates alongwith DaVita invested monies in Nephrolife; a Bangalore based renal disease management firm. 3) Tata Capital invested in Sparsh Nephrocare which has centres in smaller cities and towns. Recently Fresenius, the world’s largest provider of products and services for renal diseases acquired majority stake in Sparsh. 4) Delhi based Health Services Pvt Ltd which has centres under the brand name of Deep Chand Dialysis Centre raised funds from Pragati India Fund. To conclude, the demand for dialysis services in India is huge and players need to innovate and come up with business models to cater to this opportunity. Volumes can be really large in the lower and middle income groups. However Government empanelments are critical to service that segment. A lot of PPP models have also been started in this segment especially in North India. Players should be open to collaborate with other hospitals. There can be business models where a dialysis care specialist operates out of Hospitals and offers them a revenue share. Sparsh Nephrocare has done that. As the size of the middle class and people with disposable income goes up, the number of people seeking and staying on dialysis will keep growing. Entry of dialysis chains, like Nephroplus, DaVita and Fresenius is likely to bring operational as well as clinical improvement through establishment of quality measures, uniform protocol-driven practices and accountability. Overall, these are interesting times for this industry and a focussed player can clearly create a double bottom line impact, by serving the society and at the same time reward its shareholders!! 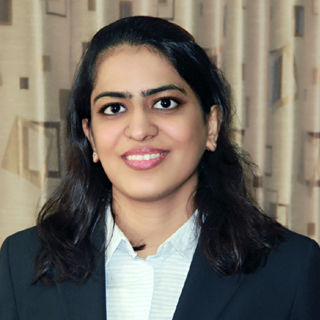 Shilpa Bhattar is the Director and Founder of Reevolv Research, a market research company based in Mumbai. Having six years of experience as an Investment Banker she has extensively worked in the financial services sector namely Banking and Insurance across global markets and other sectors like Apparel, Power, Healthcare, Media, Infrastructure, Retail etc. Being a former Investment Banker she has worked with reputed firms such as Morgan Stanley, Enam Securities and Kotak Investment Banking. She established Reevolv in 2011. By synergizing her efforts as an investment banking professional with a team of highly qualified fact finders, she has built a name and reputation for Reevolv. Shilpa is a Bachelor in Commerce from Mumbai University. She is a rankholder Chartered Accountant and has cleared all three levels of CFA.